Reptiles populations in the UK are reducing, but whilst the species are legally protected from harm (Wildlife and Countryside Act 1981), their habitats remain unprotected. Therefore, if a population of reptiles is found to be present on a site that is subject to development, the common response is to remove the animals to a suitable long term receptor site. In their paper, Nash and Griffith highlight previous research that indicates, adder and grass snake display routine patterns in their movements in response to resource availability. To date, there have not been any rigorous research studies into the effects of translocation on these behaviours and the species’ response to this kind of disturbance; in the UK, the results of research projects in other countries have largely been used to predict likely effects. These studies have found that individual snakes moved to a new site, tend to cover larger distances than resident animals (often at a cost to other behaviours such as foraging and breeding (Wolf et al., 1996)). It is thought that the ranging behaviour exhibited by such individuals is indicative of homing tendencies and the consequences of sub-group formation. The study undertaken by Nash and Griffith, sought to ascertain the spatial effects of translocation projects on adders. 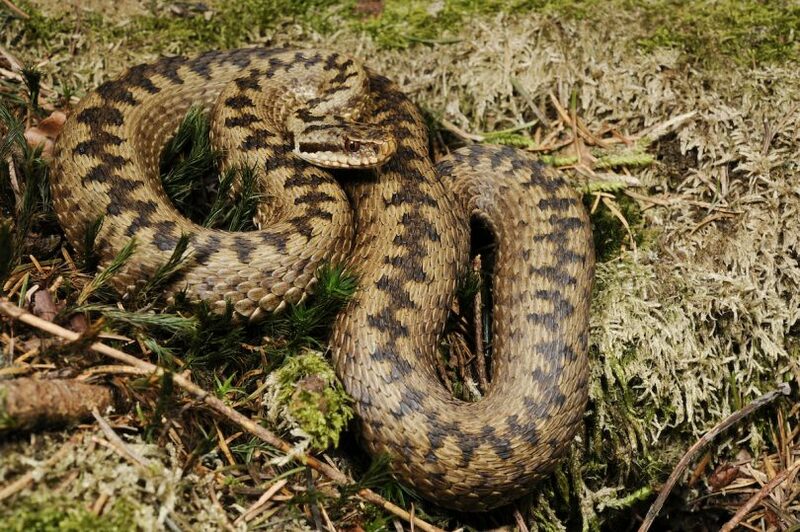 The research comprised studying a population of adders on a disused golf course in Essex (UK). The receptor site for the adders was on the same golf course, but around 500 m away from the snakes’ origins. A total of eight snakes were fitted with external radio transmitters (six male and two female). Data was gathered over a period of ten days after their release (April 2014) and again over the same time period a few months later (August 2014); location data for each animal was recorded three times a day. The adders that were tracked in the second of the ten-day periods comprised two translocated adders and four resident adders from the receptor site. In total, six translocated animals and four resident adders were successfully monitored. Even with such a small sample size, a clear difference was exhibited between male and female responses to the translocation, and between relocated males and resident males at the receptor site. Males were shown to range much further than females (over three times further) and the translocated males travelled twice as far as the resident males. Perhaps of greatest concern is the finding that males were prepared to cross areas of “unsuitable” habitat when moving away from the receptor sites – exposing these individuals to higher risks of injury and mortality. The increased movements of the males is also likely to have a detrimental impact on the individual’s physical condition, in addition to breeding behaviour. Two of the adders travelled back towards the site they had originally occupied. The reasons for the movement of males away from the receptor site, despite the presence of viable breeding females is not entirely clear, although Nash and Griffith offer a potential explanation drawn from research undertaken by Phelps (2004), which showed that sub-groups within adder populations did not interbreed. It is clear from the results of the study that these important considerations with regards to snake translocations need to be incorporated into mitigation projects. Furthermore, the study has highlighted the significant information gaps in developing mitigation strategies for reptiles – for example, the absence of published data regarding the ‘typical’ home ranges of adders. It also potentially negates assumptions that by providing buffer strips of unsuitable habitat at the edges of receptor sites, snakes will be contained within the site. This study shows that these assumptions cannot be relied upon in the case of adders. Header image: Benny Trapp/Wikimedia Commons.